First, I have to say that I have some of the best cousins who allow me to join in on their fun adventures which is really fantastic for my children since I am an only child. 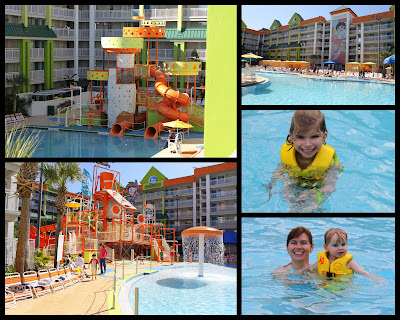 On our recent trip to Florida, we stayed at the Nickelodeon Hotel http://www.nickhotel.com/. For those of you in Europe reading this you are most likely wondering what is Nickelodeon??? Well, it is a cartoon TV station here in the States that is most famous around the world for Sponge Bob Square pants. He has different names around the world like in Germany he is called Schwarmkopf. Normally, I don't think I would have considered staying at this hotel; however, my cousins were staying here and I wanted to max out the amount of time spent with them. The hotel while not the Marriott was fantastic! My children loved the in-house water park. 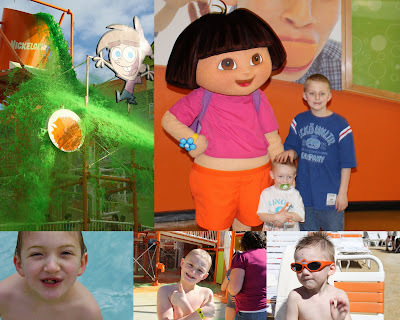 This hotel is really geared for families and cater to children by providing different activities for them to participate in all day long. The great thing was I was able to book my room for about a hundred dollars less, by going on line and booking through Hot wire.com or maybe it was Expedia.com. I also was able to get my room cheaper because I choose a one bedroom with a pull out couch. My only complaint would be that I couldn't find any luggage carts and had to make three trips down to the car to get all the luggage. I also thought that the food in their food court was also way over priced. How nice of you to leave a comment on my blog. And indeed, the birdcake is a super easy and nice project to do with kids! what a hotel!!! I am sure your boys were in heaven!! That hotel looks incredible! My kids would think they were in paradise if we stayed there. Lucky! That sounds like a fun hotel! Thanks for commenting on my blog!